Having written all nearly 200 posts since I started writing this blog I now thought it would be interesting to try and broaden the voices involved. So as the first post in this new direction/experiment, I am delighted and honoured that one of our leading architectural historians, Jeremy Musson, kindly agreed to write a piece on country house ruins linked to his new book published this month, ‘English Ruins‘, a fascinating look at their role in shaping our perceptions of the past and our architecture. The English landscape is a landscape of ruins. Fragmentary or sometimes only roofless and windowless, these part dismantled buildings stand out to mark our national history in a number of different ways, and above all, provide a sense of historic scenery for our journeys, physical and imagined – and glimpsed from motorways and footpath alike. In this new book, photographer Paul Barker and I wanted to explore something of this particular cultural landscape and through this exploration trace something of how the English see themselves and their past. I feel that we live in an old country, and the past is always there, to paraphrase T.S.Eliot, “pressing on the future”. Some love the past, some hate it, many are indifferent to it, happy enough to take pleasure in a good day out, with a dash of historic scenery. But the whole process of our encounter with ruins, is somewhat special – a deeply subjective, and in effect, an almost artistic experience. It is personal and often emotional, while it is also formed and shaped by a whole series of sometimes opposing cultural inheritances: Romanticism, anti-establishment, veneration for the classical, veneration for the Gothic, history seen through the very shape of the landscape. During the 18th century, the Grand Tour, part of the expected education of a gentleman or aristocrat, consisted of a journey through Holland and France to visit the great monuments of the Roman world, excited the aesthetic and cultural awareness of the 18th-century English gentleman, who was in turn the patron of artists and architects following the same path in trying to import the drama and excitement of great classical ruins to an English audience. Walk through any major house built in the 18th century, with anything of its original collections still in situ and the ruin is visible in painting after painting, and then echoed in the classical temples of the park. The phenomenon of creating artificial ruins, in which the English seem to be pioneers, belongs to this period, and while the earliest garden temples seem to be classical, the contrivance of designing ‘ruined’ structures, was largely sourced in England’s own Gothic past. Horace Walpole the 18th-century diarist, who designed his own Gothic style house, Strawberry Hill, hugely admired the work of Sanderson Miller who designed a ruined tower at Hagley Park, with the perhaps slightly teasing phrase that it had “the true rust of the barons’ wars” referring to the Wars of the Roses. When making this tour of England in tandem with photographer Paul Barker, I could not help noticing that we were often treading in the footsteps of the great landscape painter, J.M.W.Turner, for whom the evocative power of the ruin played a central role in his career, although we perhaps think of him most naturally as a landscape painter, and a painter of skies. In the last years of the 18th century he exhibited numerous studies of great historical ruins in landscapes, appealing to the Romantic spirit of his audience – characteristically these are the foil for dramatic expositions of sky or sea. He continued to make special studies of ancient ruins, castles and abbeys on tours around the whole of England, for his ambitious Liber Studiorum project, and many were published in different histories, especially in Charles Heath’s Picturesque Views in England and Wales. Turner looked principally at abbeys and castles, but abandoned country houses have come to be a feature of our landscape too. The dramatic changing status of the country house from the first world war, into the great depression of the late 20s and early 30s, becomes even more intense after the second world war – think of John Harris’s memoir, No Voice from the Hall. This was a period which resulted in so much change in English life, that it is easy to overlook the symbolic collapse of the world of the English country house. This was a feature of interwar life too, with the rise of income tax and death duties, but the upheaval of the Second World War, the widespread institutional use of country houses for military and other government purposes often hastened their subsequent abandonment. Inevitably, given my interest, the country house looms large in our new book. We focus on the story of buildings from different themes and for the ruins of country house, beginning with Cowdray House, in Sussex, a substantial Elizabethan mansion damaged by a fire in the late eighteenth century, and then abandoned, partly as a result of complications over inheritance; but quickly becoming a destination for artists, for instance, Turner visited the ruins while staying at Petworth – it is now looked after by a newly formed trust, and feels like the sets left over from a Grand Opera, standing amongst the meadows and paddocks on the edge of Midhurst. We also visited the ruin of an elegant early-seventeenth-century lodge at Wothorpe Towers, a lodge once part of the Burghley estate, which was used as a dower house and then, apparently, part dismantled to provide an eye-catcher in the new landscaped park. It was falling into serious decay and has recently been taken on by the Griffin family, who putting the main house into a trust, which is restoring the gardens, are converting the ancillary seventeenth century buildings into a new home. The classical country house tradition is represented in our book, by 1720s Seaton Delaval Hall, near Newcastle – one of the finest houses by Sir John Vanbrugh, re-roofed after a major fire, the interiors are otherwise the very picture of a ruin. In Derbyshire, we encountered the memorable and mournful spectacle of Sutton Scarsdale Hall in Derbyshire, also built in the early 18th century. The latter, partly due to its proximity to mine-works, acquired in 1919, by businessman out to profit from its materials and fittings. The panelling was sold United States collectors, and some at least found its way into the Museum of Fine Arts in Philadelphia. Its demolition was in fact prevented by local landowner Sir Reresby Sitwell, whose family later presented it to the state. James Lees Milne, looked at the Sutton Scarsdale ruins for the National Trust, but said that “classical ruins in England are much satisfactory than Gothic ones, the lack picturesque gloom.” English Heritage look after it now, as they do Witley Court, a multi-layered great house and former seat of the Earl of Dudley, a splendid Italianiate palace with a vast portico by John Nash, was burnt out in 1937, and by some chance was not demolished during the 1950s, like so many abandoned houses, and it was subject to preservation order in the 1970s, and in the early 70s taken into state protection. Christopher Hussey thought that it conjured the beauties of the classical ruins visited by the Grand Tourist in the 18th century, as much as anything else. Forgotten Victorian Gothic mansions such as Lowther Castle in Cumbria, possibly become more Romantic in their ruined state. Lowther, the historic seat of the Earls of Lonsdale, designed by Smirke in Gothic baronial style was not re-occupied after the second world war, and in 1957, de-roofed and only the exterior walls preserved. A haunting presence in the beautiful Cumbrian landscape, a new trust has been created to protect the runs and open them and the overgrown Edwardian gardens to the public, in the course of 2011. For myself, as a historian of the English country house, there is no doubt that the ruin occupies a special place in English culture; the castle, the abbot’s lodgings, the country houses of the sixteenth century onwards, when they stand open to the elements, draw us in to a dialogue with our history and the mutability of fortune. Jeremy Musson’s ‘English Ruins‘ with photographer Paul Barker, is published by Merrell publishers. Text by Jeremy Musson, choice of links and images by Matthew Beckett. Dear Readers – as always I welcome your comments and feedback. This entry was posted in Comment, News and tagged architecture, burghley, charles heath, christopher hussey, conservation, country house, cowdray house, derbyshire, english, english heritage, english ruins, gothic, grand tour, hagley hall, heritage, horace walpole, houses, j.m.w. turner, james lees-milne, jeremy musson, john harris, john nash, lincolnshire, lowther castle, paul barker, petworth, romantic, sanderson miller, seaton delaval hall, sir john vanbrugh, strawberry hill, sussex, sutton scarsdale, witley court, wothorpe towers. Bookmark the permalink. Thank you for having Jeremy Musson. I recently tore through and thoroughly enjoyed both ” Up and Down Stairs” and “How to Read a Country House.” I was fascinated by both books and find his writing always scholarly and never pedantic. This author writes books that I hate to see end. Kudos to Mr. Musson and to this blog for consistently great content. By a strange coincidence my copy of ‘English Ruins’ arrived in the post during lunch today. Needless to say, it’s a treasure – not just for the sensitive and subtle photography, either, although this is clearly a book to set on the shelf beside the old volumes of Edwin Smith photographs, but for words as well, some of them quite surprising – e.g. fascinating essays on Orford Ness, unloved housing stock in Liverpool and Battersea Power Station, as well as the more obvious, if always fascinating ones on more typically ‘country house’ type themes. Congratulations, then, to Mr Musson on his new publication – and to ‘The Country Seat’, as ever, for being such an unmissable daily blog-visit. Jeremy is certainly having a busy publishing year, with English Ruins being the second of three books, the others being English Country House Interiors (due in Autumn, also with photographs by Paul Barker, who first worked on Jeremy’s The Country Houses of Sir John Vanbrugh) and A Cotswold Jewel in Stone, The Story of Temple Guiting Manor (January 2011). I only wish that Jeremy had made further TV series of The Curious House Guest, as two series didn’t seem enough. Although, for obvious comfort reasons, he understandably would not want to combine The Curious House Guest format with his ruins work! I do find ruins both fascinating and regretful, as they reveal the skeleton of a once great and vibrant building, often showing the inner workings of its construction. 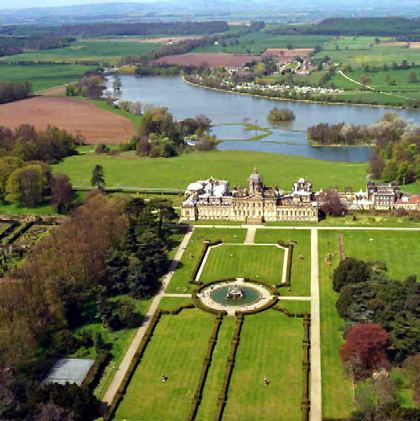 My favourite ruin would have to be Witley Court, with its sweeping lawns leading to its magnificent fountains, all very reminiscent of Castle Howard. Keep up your great work, Jeremy! Just in terms of ‘broadening the voices’ hereabouts, have you ever considered adding a discussion forum to the blog, Matthew? Thanks for the suggestion but WordPress doesn’t currently offer the ability to incorporate forums into a blog. I would also be reluctant as (having run them before for a short time as part of a former job) they require quite a significant amount of time to monitor and supervise which I just can’t accommodate. Perhaps it is something that can be considered in the future but at the moment I’m afraid we’re just limited to commenting on posts.